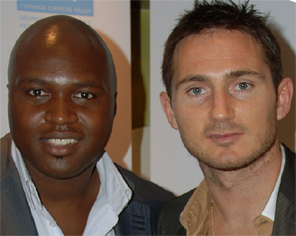 Godfrey Torto has worked at some of the highest levels of the game, ranging from endorsement deals with Frank Lampard to supporting leading Football charities such as the Bobby Moore fund. His credentials within football are second to none, having built a reputation for fairness and support for Footballers charitable initiatives. UJR: HELLO GODFREY, HOW ARE YOU DOING? GT: I am fine thank you. UJR: I UNDERSTAND YOU ARE A FORMER PROFESSIONAL FOOTBALLER. HOW DID YOU BECOME INVOLVED WITH THE WORLD OF FOOTBALL? GT: I started playing when I was say 8 - 9 and then joined my local team Junior Bees who were connected to Brentford FC, from there I played for West Middlesex Colts and we ended up being the best team in the country 2 years running. When I went onto Isleworth & Syon secondary school we won the Middlesex cup in our first year. It was there I was scouted to play for Chelsea FC. I guess it all started from there really. UJR: I KNOW THAT YOU USED TO PLAY FOOTBALL ALONGSIDE CHELSEA FC & FORMER ENGLAND CAPTAIN JOHN TERRY. HOW DID THAT COME ABOUT? GT: Well while I was going through Chelsea Fc's youth ranks, John was coming through 2 years below me. He was a midfielder than, he was a stand out player in his year, so sometimes he joins us for games. It was a great experience playing at Chelsea Fc at that time. Glenn Hoddle was the first team coach, I remember playing in practice games with Mark Hughes and myself upfront as well as playing with Ruud Gullit one of the greatest players to ever play the game. UJR: DO YOU THINK THERE IS A BIG GULF BETWEEN AMATEUR FOOTBALL AND THE PROFESSIONAL GAME? GT: Well yes most definitely there is, especially with all the money that is at the top level. The clubs are able to buy the best players in the world so the difference has become bigger than in the past. Over the last 10 years the premiership has become huge and the biggest in the world so the gulf has increased from where it was say before, however I would still insist that there are some tremendous players in the amateur Semi-professional football. They just need a break. UJR: I KNOW YOU ARE CURRENTLY DOING A LOT OF WORK IN RAISING THE AWARENESS OF SICKLE CELL. HOW DID YOU GET INVOLVED IN THIS CAMPAIGN? GT: Well my son Jamare aged 10 has Sickle Cell s/c condition. I was not even aware of what Sickle Cell was until we went for normal check ups before my son was born. I was 20 years of age at the time, so I figured that if I was not aware at that age then there must be plenty of other people that aren't aware also. This triggered me to start raising awareness and funds for local Sickle Cell Support groups by staging Dinner and dances, concerts etc. UJR: WHAT KIND OF EVENTS TAKE PLACE TO RAISE AWARENESS? GT: We hold a yearly event called 'The Toy Story' where guests bring gift wrapped children's toys and these are given to Chelsea & Westminster hospital for there work with Sickle Cell patients are their families. We also plan to stage an event called 'Give for Sickle Cell' which will be focused towards raising awareness for Sickle Cell and much needed funds. UJR: HOW CAN MEMBERS OF THE PUBLIC CONTRIBUTE TO THE AWARENESS CAMPAIGN? GT: Keep on the look out for www.goodofthegame.com which will have information on how to support the campaign and causes we endeavour to support. Also at askgodders.com where you'll be kept updated with progress etc. With regards to Sickle Cell - www.sicklecellsociety.org are a good organisation that support other Sickle Cell groups across the country. UJR: YOU HAVE MANAGED TO INVOLVE A NUMBER OF PREMIERSHIP FOOTBALLERS WITH THE CAMPAIGN. WHAT ROLES HAVE THEY TAKEN UP? GT: In the past couple of years players such as John Terry has donated his signed England shirt for auction at an event we staged last Christmas called 'The Toy Story' raising awareness for Sickle Cell and also giving toys to Chelsea & Westminster Hospital children for the hospital great work towards Sickle Cell. David Beckham also donated his own England signed shirt from his last World Cup with a note saying 'with Love for Sickle Cell'; Sven Goran Erikson also signed it. With regards to future projects we aim to work with a number of footballers closely from Carlton Cole, Frank Lampard to name a few. UJR: DO YOU HAVE ANY NEW PROJECTS ON THE HORIZON? GT: I currently have a project called 'The good of the game' which is based around supporting all things well within Football. That means supporting Footballers and their charities by helping raise awareness and funds. Also supporting initiatives by Football clubs and local clubs. We aim to host the first 'Footballers Charity Ball Awards' which will highlight awarding footballers for their charitable exploits and work within the community. UJR: WHICH PERSON INVOLVED WITH FOOTBALL, HAS HAD THE BIGGEST INFLUENCE ON YOU? GT: I would say Garth Crooks; I first met Garth around 7 years ago through good friends Carl Leaburn and Michael Bennett both formerly of Charlton Athletic. Since then he's been a constant positive influence on my life, not just in football mainly life in general. Going back to my younger years, I'd have to say Bob Osborn, he scouted me when I was 12 years of age to join Chelsea FC and he still works for the club now as head of Youth development. UJR: WHAT ADVICE WOULD YOU GIVE TO ANY YOUNG ASPIRING FOOTBALLER? GT: I would say the most important thing to do is to stay focused; there are so many distractions, even more so now. You have to work hard and stay focused on doing your best every time you play and also conduct yourself well away from the pitch. Your school work and studies are more important also as realistically, many kids will not make it, so it's key to have other opportunities for you. However without question if it's your dream to be a professional Footballer and you have the ability, follow that dream with all you have. UJR: WHAT IS YOUR FAVOURITE FOOTBALLING MEMORY? GT: It's hard to pick one out really; I have so many stacked in the brain library. If I'm honest I think when I was a kid winning The Canary Cup at Norwich FC Carrow rd aged 13. It was a massive achievement for our West Middlesex side and I was given Man of the match. We beat Glasgow Rangers FC in the final. We were a Sunday team, but we managed to beat some club sides and win the cup. They gave me a pair of New Balance boots which Bryan Robson wore. Great times!